Mi Flash Pro v3.3.319.52 is a small application for windows computer which allows you to manage your Xiaomi Smartphone, Manage the Recovery, Downloading Stock Firmware, Flashing the Stock Firmware or OTA firmware on the device. 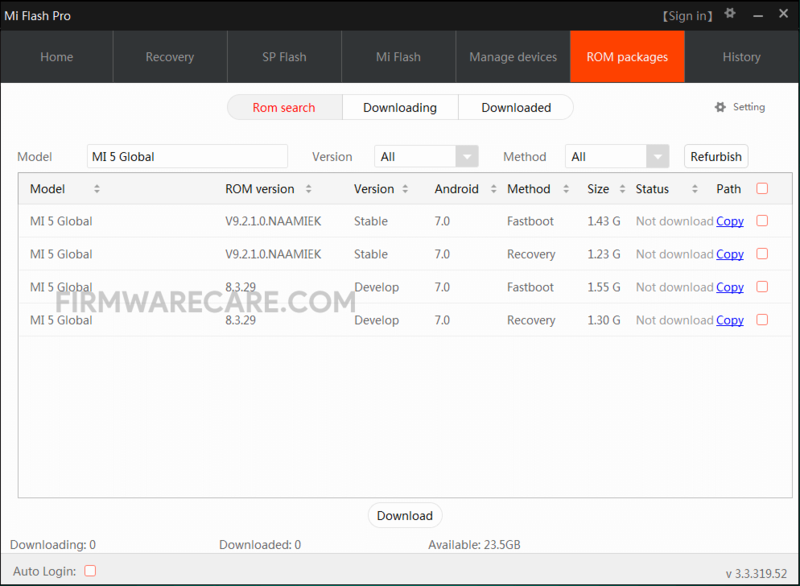 It also allows you to flash custom recovery on your Xiaomi Smartphone, Flashing Stock Firmware on your Xiaomi Device, Managing the Xiaomi device, See the History of the Xiaomi device. It also allows you to download the OTA or Full Firmware of your Xiaomi device whether your Xiaomi device is of Chinese region or global region. [*] Compatibility: The Mi Flash Pro v3.3.319.52 Tool runs perfectly on Windows XP, Windows Vista, Windows 7, Windows 8, Windows 8.1 and Windows 10 (32 bit and 64 bit). [*] Credits: Mi Flash Pro v3.3.319.52 is created and distributed by 4pda Forum (developer). So, full credits goes to 4pda Forum (developer) for sharing the tool for free.